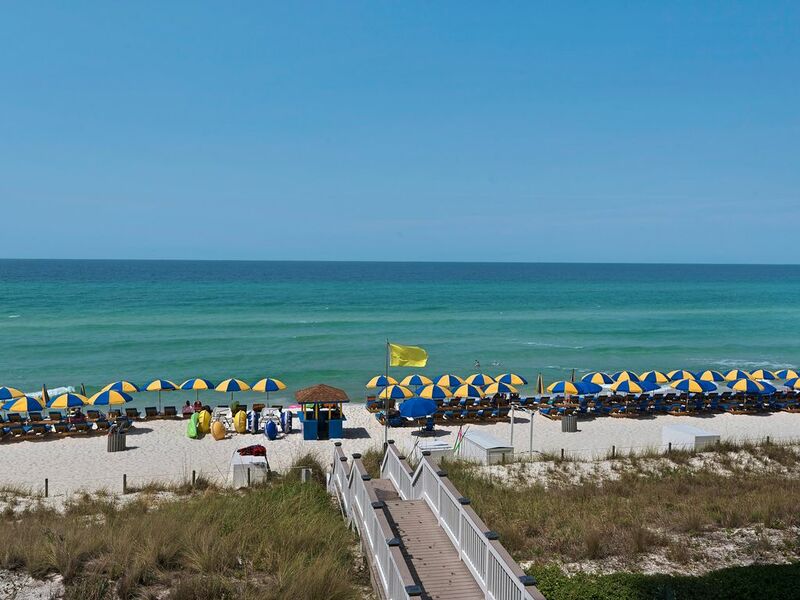 3BR/3BA W/Bunks-2 Gulffront Master Suites - BOOK For Spring NOW! Panama City Beach's newest and most luxurious beachfront condominium. Sterling Breeze was named 'BEST CONDO' by the readers of Panama City Living Magazine. Sterling Breeze is the perfect family vacation destination. Our condo is ideal for two families. it offers 2 gulf front master suites, each has a king size bed and own bathroom. The third bedroom has a queen size bed. There is also a bunk area and an additional bathroom. This the only floor plan like it in the building. It will accommodate 10 people comfortably. Our condominium is like a home on the beach. It has over 40' of beach front balcony, 10' ceilings, large pantry, full size side by side washer and dryer, plenty of closets, electric grill on the balcony, a 52' flat screen TV in the living room, flat screen TV's in all the bedrooms, high-speed wireless internet, cable TV and HBO, 4 DVD players, granite counter tops in kitchen, double vanities in all 3 bathrooms. It is located on a low floor, fully furnished and professionally decorated. Sterling Breeze amenities include a gulf-front overflow edge pool and spa, state-of-the-art fitness center, pool side internet cafe & wine bar, and covered parking. Sterling Breeze is located less than 1/4 of a mile from Pier Park, featuring popular restaurants, amusements and shopping. Also it's less than a mile from Frank Brown Park, PCB's premier recreational park. Our guests will receive, free high speed internet access and free local and long distance telephone. All rates are subject to a 13% tax and cleaning fee. We spend Thanksgiving week here and our family loved it here. We have stayed in PCB several times, this ranks as our top spot so far. Great location, great pool, easy ocean access. Only very slight complaint was that dining room chairs vinyl was peeling off quite a bit from wear ( I am sure this will be corrected ASAP as these owners appear to take great care of stuff). We hope to be able to rent this spot again. Thank you for taking the time to comment on your stay. We are glad you and your family enjoyed Thanksgiving week in our family condo. We had ordered new chairs prior to your arrival but were on back order. The new chairs arrived the week after your stay and now we have all new dining chairs. We hope you come back again. nice condo with plenty of space. There were even chairs and an umbrella in the closer. Location is awesome. Nice place. Overall, nice place to stay. Best unit in the building as far as accessibility. It’s located right at the end of the breezeway beside the elevators. Don’t be concerned with elevator noise or people coming in and out, it’s not an issue. Very quiet considering. It’s not new but has been taken care of. Had everything we needed, including beach toys. No need to take anything. We would definitely stay here again. Location of the building is awesome. Not as much traffic on that end of town and so close to pier park. Highly convenient location for getting around town. Not as big as other high rises so the beach is less crowded at sterling breeze. Spacious condo at a great location! Our family of 9 stayed in this condo. I’ll start with the Pros. The condo is in the perfect location, best location I’ve stayed at in regards to traffic and pier park. The condo is spacious and a great layout. The hot tub and pool are awesome and also the poolside bar that has food and drinks was nice. We had a couple concerns due to cleanliness when we arrived, but we emailed the owner and he responded quick and the cleaning ladies were at our door in no time and addressed the issues. Some cons would be that you only get two parking passes. It doesn’t make sense that a condo that’s allowed 10 arm bands is only allowed 2 parking passes. We took three vehicles and had to park one at the Winn Dixie nearby which is inconvenient when you have three families going in all different directions. There is only one access to the beach. They have one set of stairs to get to the beach, during popular times there will be a line of people waiting at the stairs to get from beach to condo trying to wash their feet and stuff off. Also if you are handicapped or have a rolling wagon stairs are difficult. A pro would be the Condo being on the second floor because you can avoid elevator wait times. Also the grill in the balcony was a great addition. All in all it was a great condo. The layout of the condo is great for multiple families and very spacious. Showers and bathrooms are very nice. Thanks Raul for all your help and timely responses! We had 2 families use this condo. 4 adults and 4 kids. Perfect amount of space for all the kids to spread out. Loved that there was 2 identical master bedrooms/bath that both have a balcony and over look the ocean. The third bedroom was great for our teenage girls to have their own space. Also, the bunk beds were a nice feature! The only down side to the bunk bed area is there is no door or tv dedicated to the bunk bed area. But the 9 & 7 year olds never fussed. Hands down a wonderful experience! Condo was very nice and had plenty of room for our family. Love the proximity to the parking garage and beach without having to use the elevators. Add 3% for credit cards.